Warm, luxurious, and intimate, the Paul Gauguin cruises to places the big boats can't, with local Tahitian guides who have special insight on the islands, and a company that knows the South Pacific like the back of its hand. 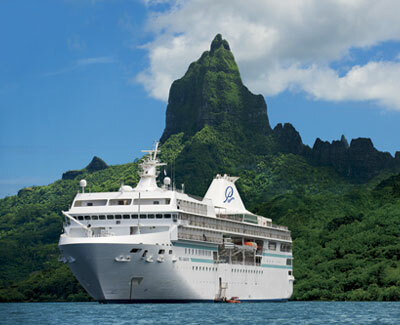 Welcome aboard the Paul Gauguin for a luxury cruise of Tahiti and the Society Islands, one of French Polynesia's five archipelagos. This intimate five-star ship, with a local Tahitian staff and a passenger-to-crew ratio that guarantees smooth service, has everything you desire and expect: a luxurious award-winning spa, intriguing enrichment programs, a watersports marina, and top-notch dining at three restaurants, enhanced by a blend of classic French and traditional Polynesian dishes. From your private balcony (70 percent of the Paul Gauguin's staterooms have them), you can catch glimpses of Gauguin-esque landscapes of impossibly blue seas dotted with lush islands and tropical flora. Then, as you slowly glide into a secluded, shallow lagoon, you may realize that the best thing about this cruise might not be what it is, but what it is not. You'll leave the behemoth ships and their hordes of passengers behind. Blessedly, they can't get into the bays and shallow lagoons that this more intimate, 332-passenger ship can explore. And there are no pretentious dinners to contend with—only a relaxed, casual elegance befitting exotic Polynesia and its warm residents. So, you'll be free to explore the stone maraes,/i> (temples) and carved wooden tikis on the island of Raiakea, built by ancient Polynesians. Watch firewalkers dance under a shimmering moonlit sky, reflected in the robin's-egg-blue sea, and walk the remote, white-sand beaches of Taha'a. Maybe you'll snorkel in Moorea's blue-hued bays, take a safari on Bora Bora, or hike the "Trails of the Ancients." Best yet, maybe you'll just watch the sun rise and set off the bow of the ship, your bare feet soaking up the sea breeze. In any case, you'll have everything you want, and nothing you don't.